The Mexican flag is composed of three vertical stripes : green - white � red, with the coat in its center. It represents the arms of Mexico. Drawn by the Aztecs nearly 800 years ago, it hasn�t hardly changed since this time. It consists in an eagle devouring a snake while he is sitting on a prickly pear. Aztec God Huitzilopochtli had ordered them to find the eagle on a rock surrounded by water. They found it near Texcoco, where they could establish their capital and develop their civilization, after looking this place over 5 generations. The eagle depicted is very special, it is a caracara, which is also called Mexican eagle. The latter has on its paws a very solid skin which allows him, unlike other species, to walk on sharp materials. It also has a crest. 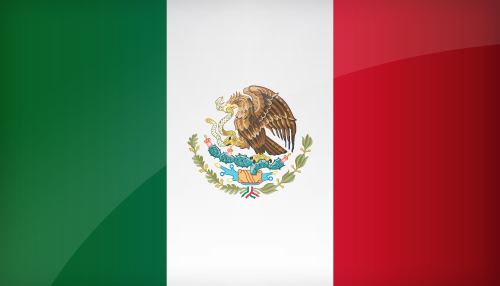 The colours are also very important for the Mexican people: green is, as usual, hope, whit is for unity in the country, and red for the blood shed for independence in 1821. This is the date that the flag was created, but it didn�t bear the Eagle yet. Appeared in November 1821, it will remain on flag until today�s one, adopted in 1968. You can download it in different sizes, in a decidedly modern design for your personal use, or for wider use. Mexico's flag is available in 4 different sizes. Resolution: Icon Size: 200 x 114 px - Blog Size: 500 x 286 px - Website Size: 800 x 457 px - Wallpaper Size: 1500 x 857 px. Keywords: Flag mexico wallpaper, Mexican, United Mexican States, National mexican flag, banner, pictogram, country, icon, Mexico icon, international, Mexico City, Mexico City, Guadalajara, Ecatepec, North America. This page has been viewed 13731 times.